Even though there's a bit of a lettuce scare out there, especially regarding the ever-popular Romaine, that doesn't mean we need to stop eating salad as we head into the summer months. This Thai peanut chopped salad uses napa cabbage and kale as the base (shaved Brussels sprouts would also work well). There's no lettuce here. And there's absolutely no cooking involved in this recipe, either. It's a bit foolproof. Even the least-experienced cooks among us can pull this off. All that's required is tossing the dressing ingredients into a food processor and chopping a whole bunch of fresh vegetables and some peanuts. The result is a beautifully colorful and crunchy salad that is bursting with flavor from that intense peanut dressing. It's Mother's Day this weekend. Most moms I know enjoy not having to cook on Mother's Day. They also really enjoy a nice salad. Just don't give her any Romaine. Add the garlic, ginger, jalapeño, lime juice, soy sauce, rice wine vinegar, vegetable oil, honey, fish sauce, sugar and peanut butter to a food processor. Whirl until completely smooth. Set aside. Add the kale and cabbage to a large bowl. Pour half of the dressing over the kale and cabbage and massage the dressing into the greens using your hands. This helps tenderize the kale. 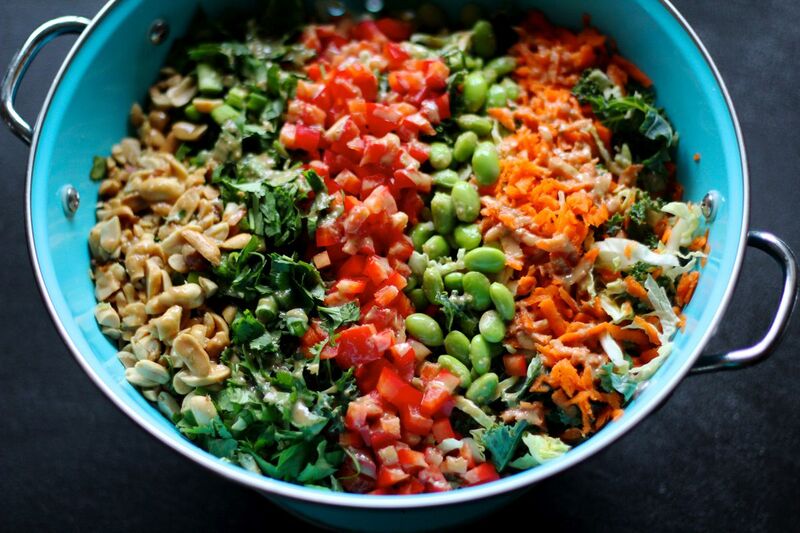 Top the greens with carrots, bell peppers, edamame, cilantro, green onions and peanuts. Drizzle with remaining dressing. Toss thoroughly before serving. Note: this can be made a couple of hours ahead and refrigerated, but reserve the peanuts until serving time, or else they will get soggy.